Director: William Dear; Format: VHS; Rating: PG; Sound: Hi-Fi Stereo, Dolby Surround; Other: Digitally Mastered, Closed Captioned; Length: 103 minutes; UPC: 765362753031. Condition: Very Good. From private collection, NOT a previous rental. Clamshell case is still in overall great shape, and tape is guaranteed to play well. Same cover design as that shown here. A little heavenly intervention might just help make a young boy's wishes come true. 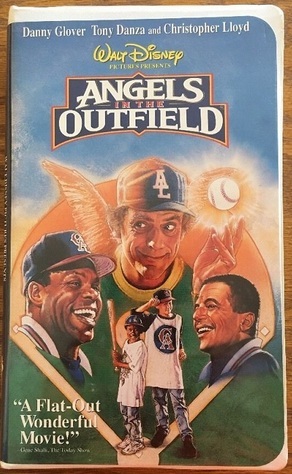 In Disney's 1994 hit "Angels in the Outfield" that is exactly what Roger is hoping for when he finds that his dream of having a relationship with his father rides on the California Angels winning the pennant. The problem is, the baseball team is exceptionally terrible and on a losing streak. The answer to his prayers comes in the form of Al, an angel who aids Roger in helping the coach turn his team into a winning one. Featuring Danny Glover, Joseph Gordon-Levitt, and Christopher Lloyd, this movie is pure fun for the whole family. Inquiries from all shoppers are responded to promptly and courteously. Buyers are encouraged to ask questions prior to placing orders, as all sales are final unless the product you receive differs significantly from that which was advertised here in terms of either the product itself or its promised condition. In other words, "buyer's remorse" does not qualify for a refund. Exceptions are made only in the event that a buyer is willing to return at his or her own expense an unopened, BRAND NEW item for a refund of the original purchase price only. No original shipping costs will be refunded, unless we are at fault for sending you the wrong item or misrepresenting the product and/or its condition. This hasn't happened yet, but if it does: you are guaranteed a refund of the purchase price, the original shipping fee, PLUS the cost to ship the item back to us. In addition, we promise that no retaliatory feedback will be left for negative comments received on such transactions. We stand behind our service, and accept responsibility for any mistakes made.